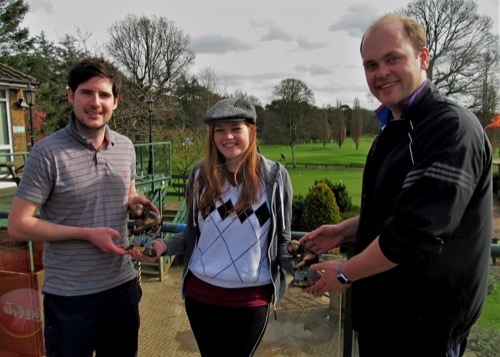 The second Walkers Cup Footgolf competition which is sponsored by the Howard Centre, Welwyn Garden City, turned out to be a family affair on Saturday at Stockwood Park, Luton. Howard Centre Manager Paul Haynes won the over fifties trophy with an eleven under par 57 including three eagles, while his son Dale was runner up in the under 50 trophy with a round of 63, five under par. Over fifties runner up was Arthur Mason with an eight under par 60, which also included a hole in one on the second hole. Winner of the under 50 trophy was Matt Aitken from Harpenden, who retained the main prize having also been the winner in 2016. Matt went round in 61, seven under par. “We held the first tournament at Panshanger Golf Complex last year and it was so successful that competitors asked for it to become an annual event and we held it at Stockwood Park this year as the course is a little bit longer with par threes, fours and a five” said Paul Haynes – Howard Centre Manager. Seventeen competitors took part in the competition raising £120 for Barnardo’s, this year’s nominated charity.